Opioid analgesics , also known as narcotic analgesics, are pain relievers that act on the central nervous system. Like all narcotics, they may become habit-forming if used over long periods. Opioid analgesics are used to relieve pain from a variety of conditions. Some are used before or during surgery (including dental surgery), both to relieve pain and to make anesthetics work more effectively. They may also be used for the same purposes during labor and delivery. Opioid analgesics relieve pain by acting directly on the central nervous system. However, this can also lead to unwanted side effects, such as drowsiness, dizziness, breathing problems, and physical or mental dependence. Among the drugs in this category are codeine; propoxyphene (Darvon); propoxyphene and acetaminophen (Darvocet N); meperidine (Demerol); hydromorphone (Dilaudid); morphine; oxycodone; oxycodone and acetaminophen (Percocet, Roxicet); and hydrocodone and acetaminophen (Lortab, Anexsia). These drugs come in many forms—tablets, syrups, suppositories, and injections—and are sold only by prescription. For some, a new prescription is required for each new supply; refills are prohibited, according to federal regulations. Recommended doses vary, depending on the type of opioid analgesic and the form in which it is being used. Doses may be different for different patients. The person should check with the physician who prescribed the drug or the pharmacist who filled the prescription for correct dosages, and to understand how to take the drug. A patient should always take opioid analgesics exactly as directed. Larger or more frequent doses should never be taken, and the drug should not be taken for longer than directed. The person should not stop taking the drug suddenly without checking with the physician or dentist who prescribed it. Gradually tapering the dose may reduce the risk of withdrawal symptoms. For pain following major surgery, it is common practice to give narcotic analgesics by intravenous injection for the first 24–48 hours. This may be followed by oral narcotics for the next 24–48 hours, and then non-narcotic analgesics. Many hospitals use patient-controlled analgesia (PCA), a system in which the analgesics are given intravenously (by vein), and the patient can control the dose by pushing a button on a pump. This system lets the patient have more control over the amount of medication needed to relieve pain, and eliminates the anxiety that comes from expecting the return of pain when the dose wears off. Anyone who uses opioid analgesics—or any narcotic—over a long time may become physically or mentally dependent on the drug. Physical dependence may lead to withdrawal symptoms when the person stops taking the medicine. Building tolerance to these drugs is also possible when they are used for a long period. The need for larger and more frequent doses is due to enzyme induction, in which narcotics are metabolized by the liver and changed to a form that can be eliminated from the body. The metabolism of narcotics relies on enzymes that are produced by the liver. As narcotics are used, the liver produces more and more of these enzymes, so that a dose of pain medication is removed from the body more rapidly. This is not a problem when narcotics are used for surgical pain, since this type of pain only lasts for a short time. Opiod analgesics should be taken exactly as directed. It is not advised to take more than the recommended dose, or more often than directed. If the drugs do not seem to be working, the physician should be consulted. These drugs (or any other prescription drugs) should never be shared with others because the drug may have a completely different effect on different people. restless or agitated when given these drugs. These problems can be controlled by adjusting the dose of medication to a safer level. Opioid analgesics increase the effects of alcohol. Anyone taking these drugs should not drink alcoholic beverages. Some of these drugs may also contain aspirin , caffeine, or acetaminophen. A person should refer to the entries on each of these drugs for additional precautions. People with certain medical conditions or who are taking certain other medicines can have problems if they take opioid analgesics. Before prescribing these drugs, the physician should be informed of any of these conditions. ALLERGIES. The patient should let the physician know about any allergies to foods, dyes, preservatives, or other substances, and about any previous reactions to opioid analgesics. PREGNANCY. Women who are pregnant or plan to become pregnant while taking opioid analgesics should let their physicians know. No evidence exists that these drugs cause birth defects in people, but some do cause birth defects and other problems when given to pregnant animals in experiments. Babies can become dependent on opioid analgesics if their mothers use too much during pregnancy. This can cause the baby to go through withdrawal symptoms after birth. If taken just before delivery, some opioid analgesics may cause serious breathing problems in the newborn. BREASTFEEDING. Some opioid analgesics can pass into breast milk. Women who are breastfeeding should check with their physicians about the safety of taking these drugs. USE OF CERTAIN MEDICINES. Taking opioid narcotics with certain other drugs may increase the chances of serious side effects. In some cases, the physician may combine narcotic analgesics with other drugs that increase the activity of the analgesic. These include some sedatives, tranquilizers, and antihistamines. When these drugs are used together with narcotic analgesics, it may be possible to get the same pain relief with a lower dose of narcotic. Some people experience drowsiness, dizziness, lightheadedness, or a false sense of well-being after taking opioid analgesics. Anyone who takes these drugs should not drive, use machinery, or do anything else that might be dangerous until they know how the drug affects them. Nausea and vomiting are common side effects, especially when first beginning to take the medicine. If these symptoms do not go away after the first few doses, the person should check with the physician or dentist who prescribed the medicine. Dry mouth is another common side effect, which can be relieved by sucking on sugarless hard candy or ice chips or by chewing sugarless gum. Saliva substitutes, which come in liquid or tablet forms, may also help. Patients who must use opioid analgesics over long periods and who have dry mouth should see their dentists, as the problem can lead to tooth decay and other dental problems. Reynolds, J.E.F., ed. Martindale: The Extra Pharmacopeia, 31st ed. London: The Pharmaceutical Press, 1993. 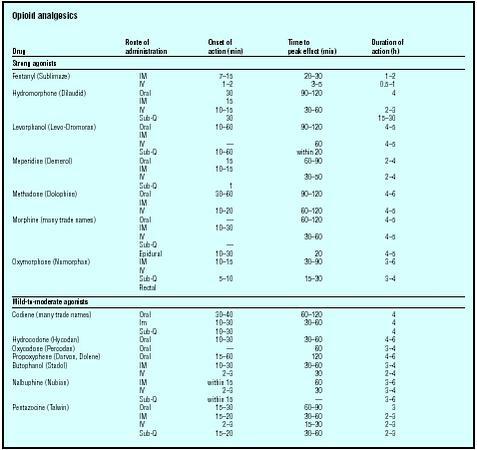 "Narcotic Analgesics for Surgery and Obstetrics (Systemic)." Medline Plus Drug Information. [cited May 2003] http://www.nlm.nih.gov/medlineplus/druginfo/uspdi/202391.html . Its an article which is educative and i find it very intresting.this will help me in my peak education. I need allot of help for these reasons.